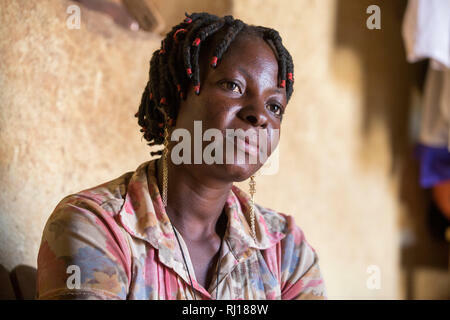 Kourono village,Yako province, Burkina Faso, Minata Guiguemde, 37,winnowing sorghum, grown on her family's farm. 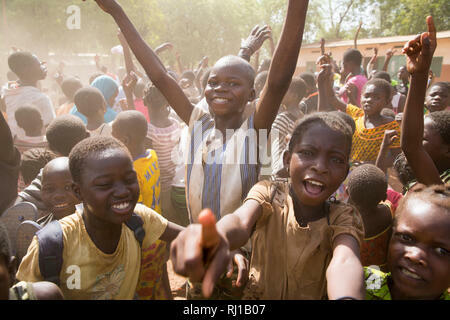 Samba village, Yako Province, Burkina Faso: Children celebrate after their school wins an inter-school football match. 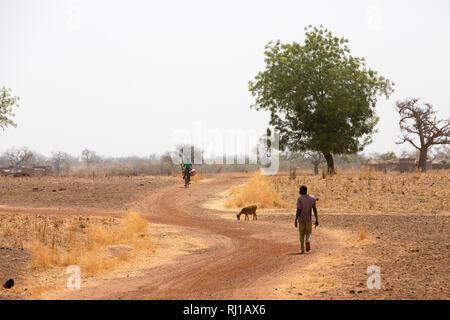 Kourono village,Yako province, Burkina Faso. 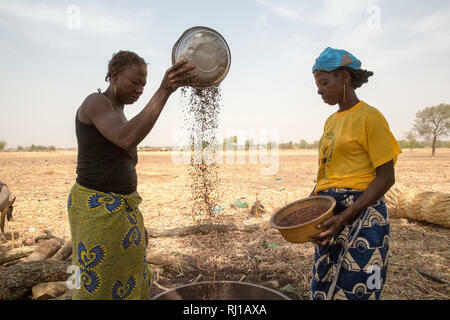 left, Minata Guiguemde, 37, with 5 children, and Kadissa Seogo, 30 with 2 children, winnowing sorghum. 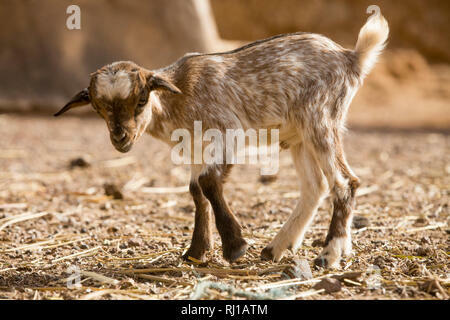 Kadissa benefitted from the goat project. 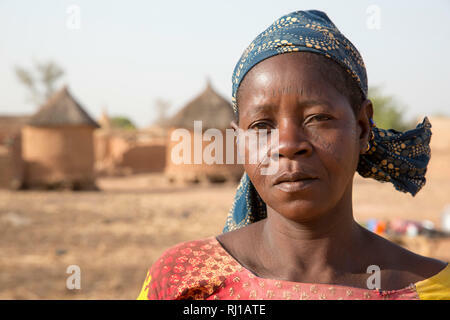 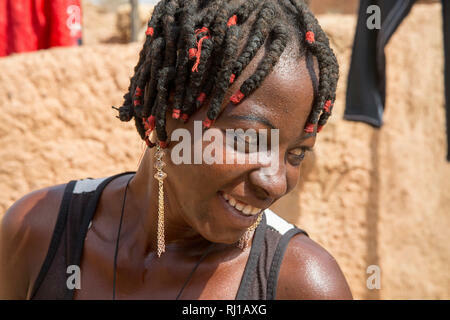 Kourono village, Yako province, Burkina Faso; Elizabeth Toro, 36. 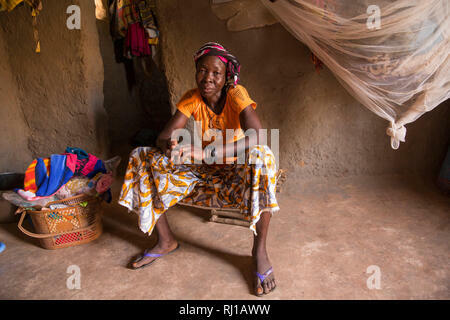 Her husband Moussa Mande, 54, is a goat project beneficiary. 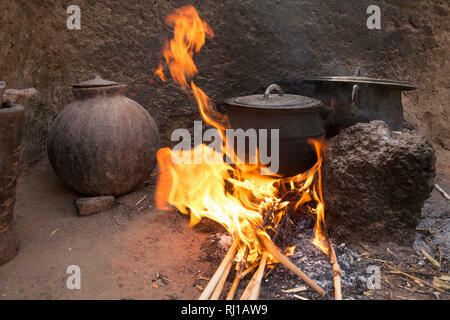 Kourono village, Yako province, Burkina Faso; Elizabeth Toro, 36 cooking the first meal of the day on an open fire in her kitchen. 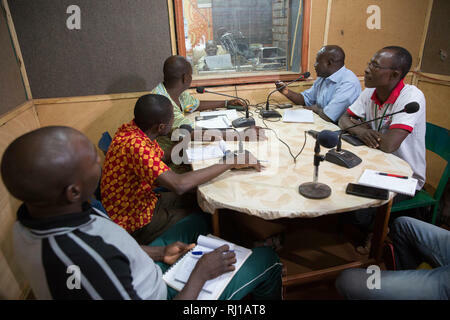 Samba village, Yako Province, Burkina Faso: Listening to an educational radio programme on nutrition and food security being broadcast by Natigmbzanga Radio. 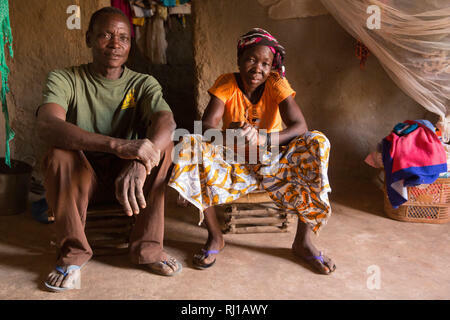 Kourono village, Yako province, Burkina Faso; Moussa Mande, 54, goat project beneficiary, with his wife Elizabeth Toro, 36. 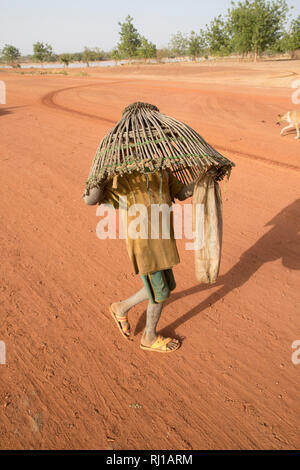 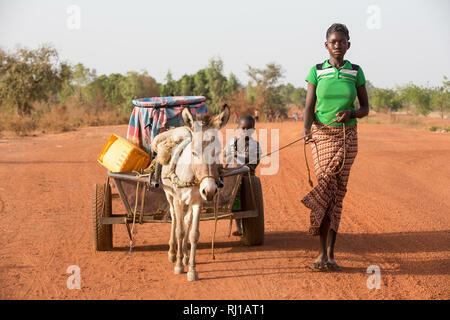 Kourono village, Yako province, Burkina Faso; Moussa Mande's eldest son on the way to the gold mines. 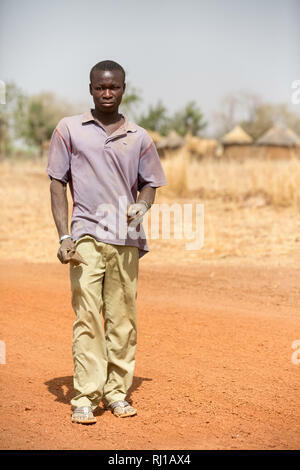 He has no education, unlike his younger brothers and sisters. 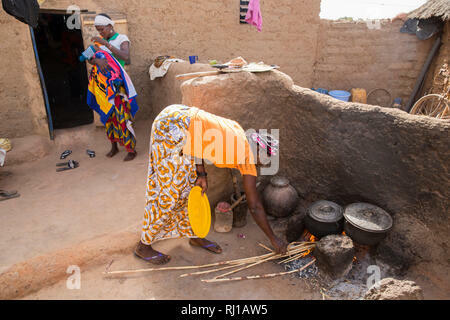 Kourono village, Yako province, Burkina Faso; Elizabeth Toro, 36 cooking. 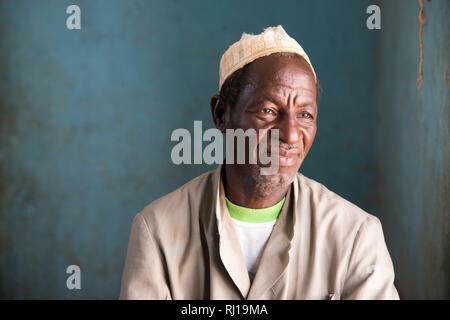 Her husband Moussa Mande, 54, is a goat project beneficiary. 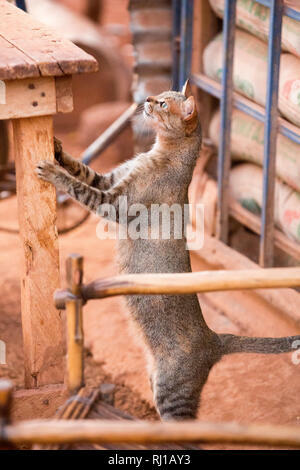 Yako town, Burkina Faso: a stray cat looking for opportunities for food on a table outside a local shop. 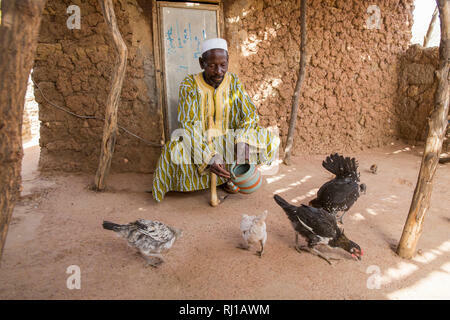 Kourono village, Yako province, Burkina Faso; Moussa Mande's father feeding poultry. 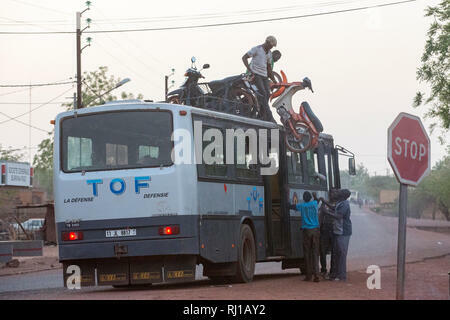 Yako town, Burkina Faso: loading a motobike onto a bus roof for a long journey. 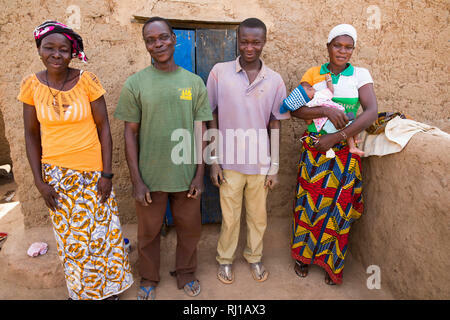 Kourono village, Yako province, Burkina Faso; Moussa Mande, 54, with his wife Elizabeth Toro, 36, their son, daught-in-law and grand-daughter. 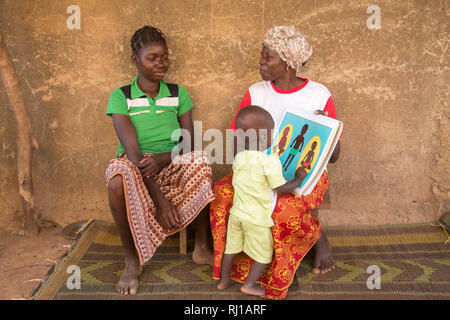 Kourono village, Yako province, Burkina Faso; Elizabeth Toro, 36, with her grand-daughter. 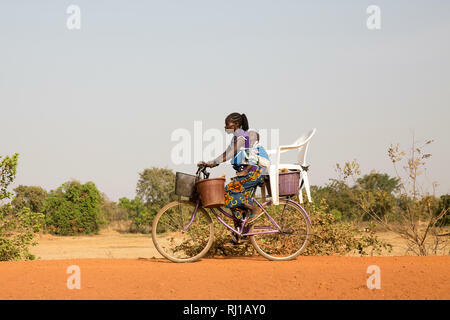 Samba village, Yako Province, Burkina Faso: A young woman carries her baby on her back and buckets and a chair on her bike. 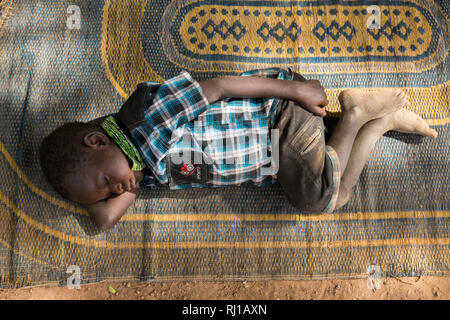 Samba village, Yako Province, Burkina Faso: a boy sleeping during a hot afternoon. 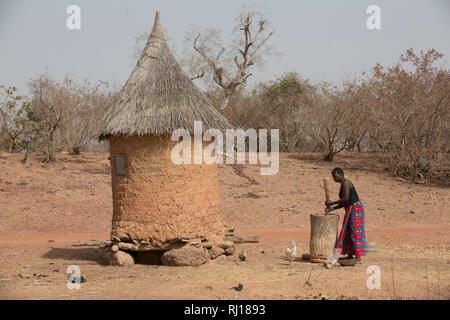 Kourono village,Yako province, Burkina Faso. 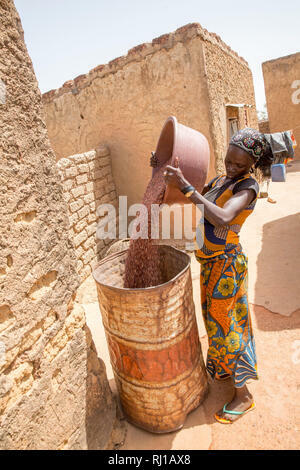 Mariam Tougma, 23, pouring sorghum she has just winnowed into an old oil drum to store for safe-keeping in her family compound. 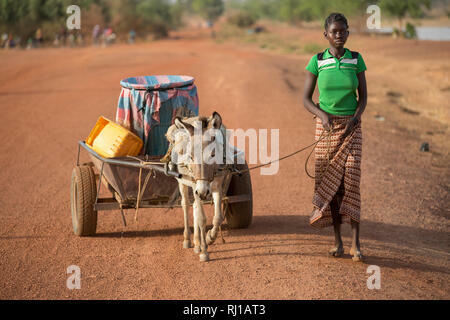 Samba village, Yako Province, Burkina Faso: Abzetta Sondo, 19, returns with full water container from the well for her household. 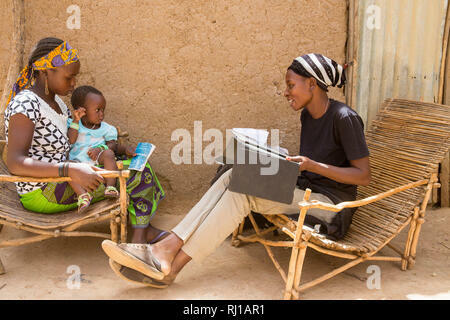 Baribsi village, Yako province, Burkina Faso; Sally Belem, 32, conducting a survey into child nutrition interviews a teenage mother. 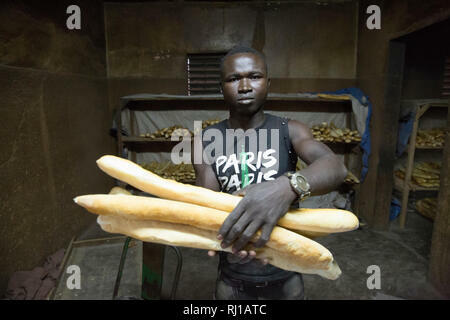 Yako, Burkina Faso; Baker with fresh loaves. 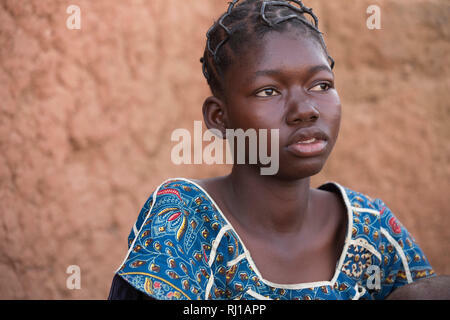 Samba village, Yako Province, Burkina Faso: Abzetta Sondo, 19,. 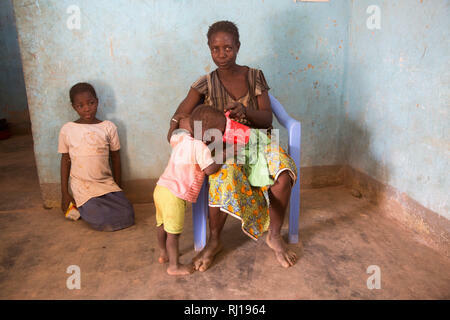 Her child is suffering from acute malnutrition. 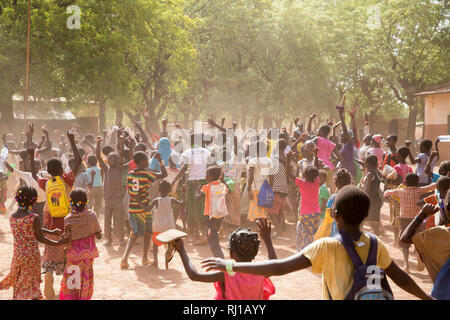 Samba village, Yako Province, Burkina Faso. 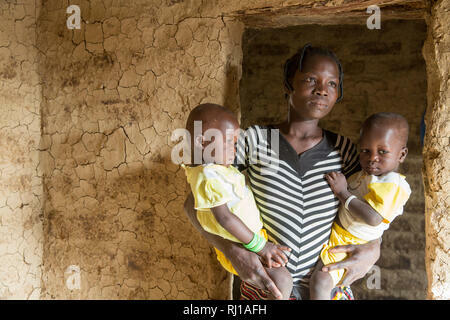 Salamata Zoundi, 27, mother of two year old triplets at her home. 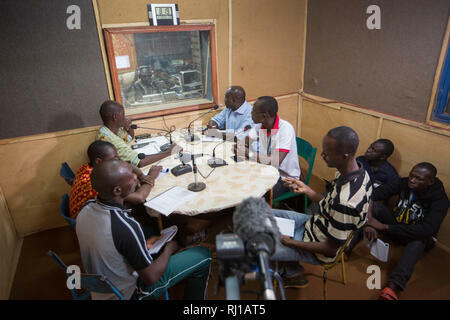 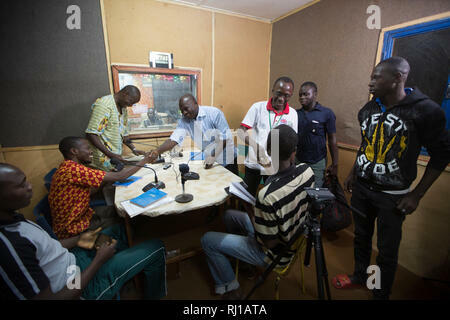 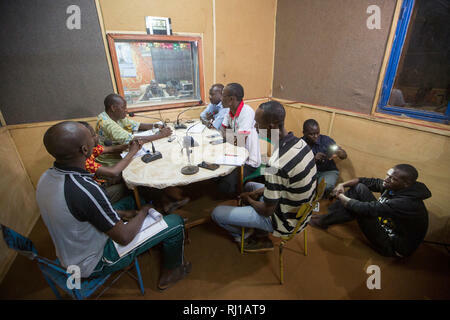 Yako town, Burkina Faso : Educational radio programme on nutrition and food security being broadcast live at Natigmbzanga Radio. 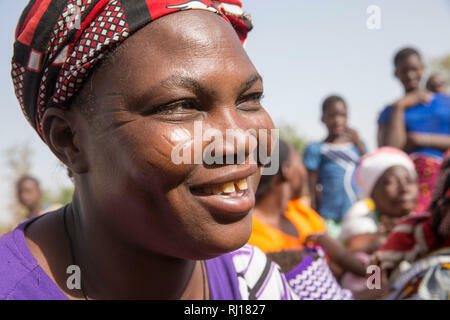 Kourono village, Yako province, Burkina Faso; A portrait of a woman with tribal marking on her face, in front of village grain stores. 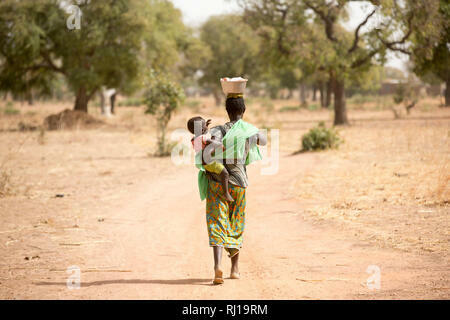 Samba village, Yako Province, Burkina Faso: Abzetta Sondo, 19, fetches water for her household. 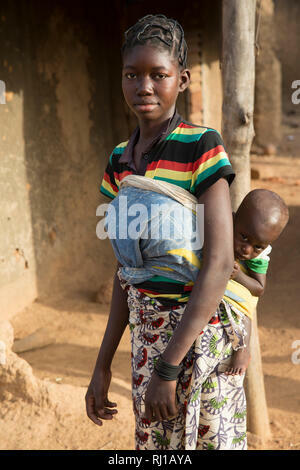 Baribsi village, Yako province, Burkina Faso; A teenage mothger with her young child at her parents house. 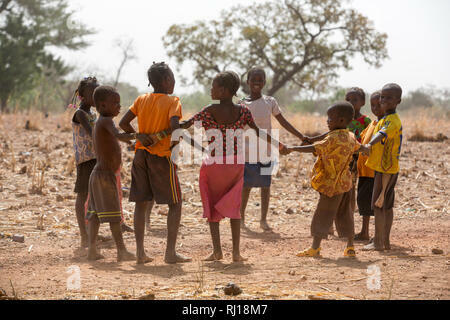 Samba village, Yako Province, Burkina Faso : Children eating fruit. 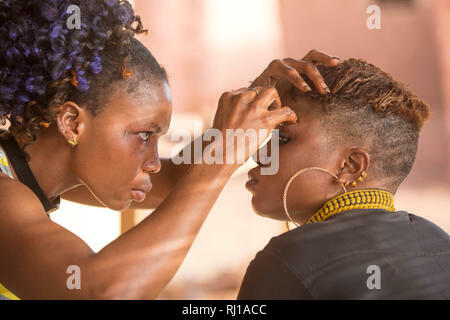 Yako, Burkina Faso; Working on eyelashes at a beauty salon. 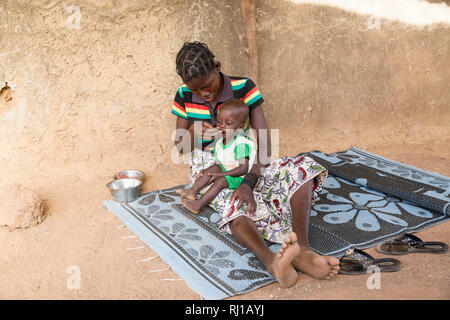 Samba village, Yako Province, Burkina Faso : Government run malnutrition clinic where children are assessed and mothers advised. 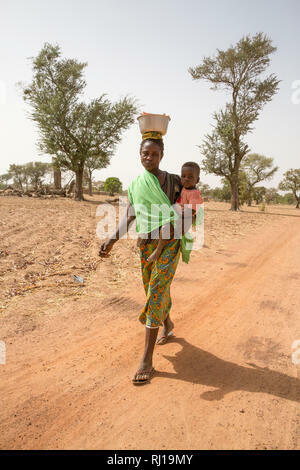 Samba village, Yako Province, Burkina Faso: Abzetta Sondo, 19, and her child Noel Nougtara, 15 months. 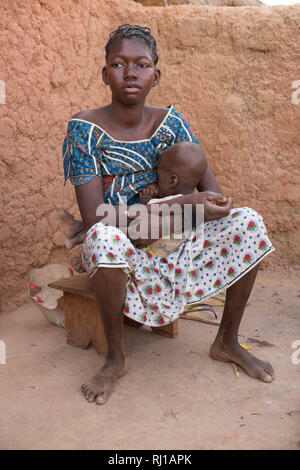 Her baby is suffering from acute malnutrition. 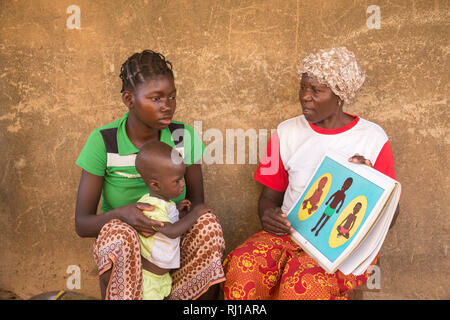 Samba village, Yako Province, Burkina Faso: Abzetta Sondo, 19, and her child suffering from acute malnutrition, get instruction from Helene Pagoundba, nutrition education committee member. 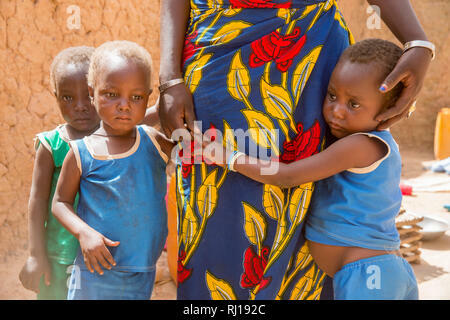 Samba village, Yako Province, Burkina Faso : Mamounata Kologo, 28, with her twins Abdmounourou and Samiratou Zoundi, 20 month old. 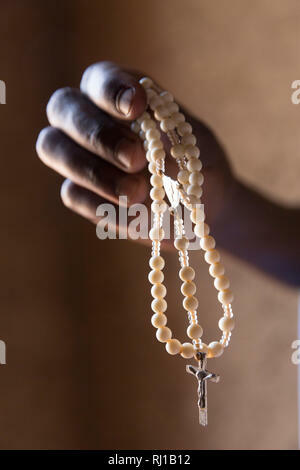 Samba village, Yako Province, Burkina Faso: Abzetta Sondo, 19, holds a rosary. 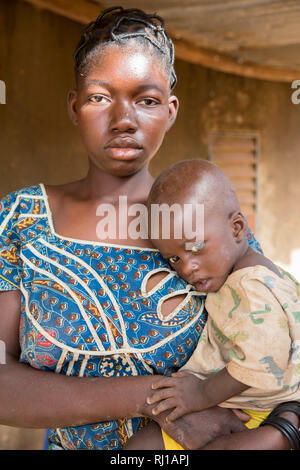 Her child is suffering from acute malnutrition. 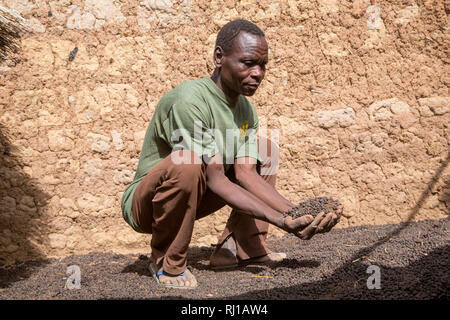 Kourono village, Yako province, Burkina Faso; Moussa Mande, 54, goat project beneficiary, with goat droppings he will use to fertilize his crop fields. 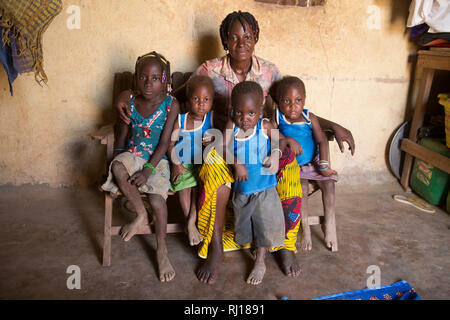 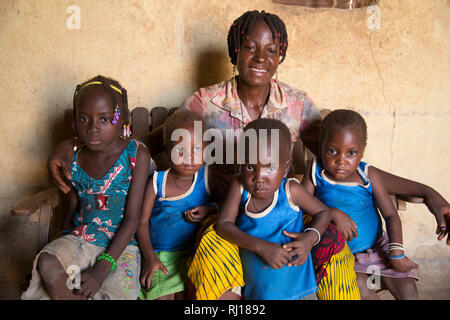 Samba village, Yako Province, Burkina Faso; Salamata Zoundi, 27, with her children left to right Adele, 7, triplets, 2, Christelle, Christine and Christophe. 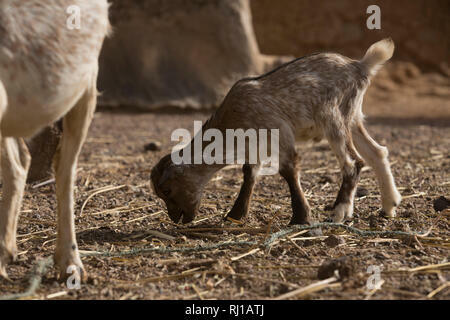 Kourono village, Yako province, Burkina Faso; A young goat kid recently born on Moussa Mande's farm. 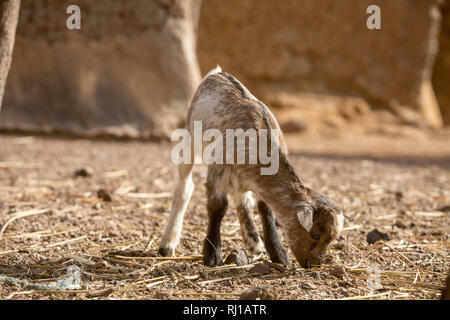 He is a Tree Aid goat project beneficiary. 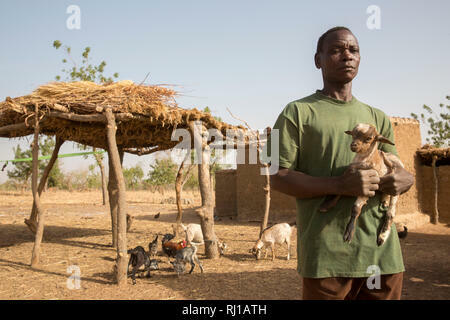 Kourono village, Yako province, Burkina Faso; Moussa Mande, 54, goat project beneficiary, also has pigs. 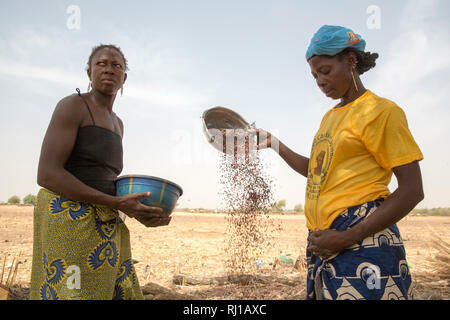 Samba village, Yako Province, Burkina Faso; A woman pounding grain by her grain store. 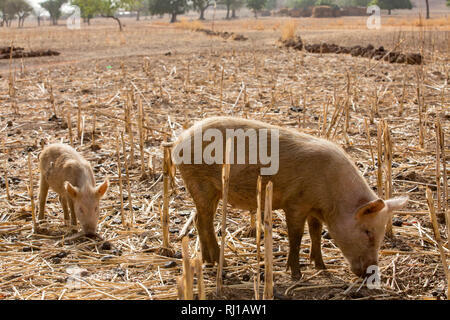 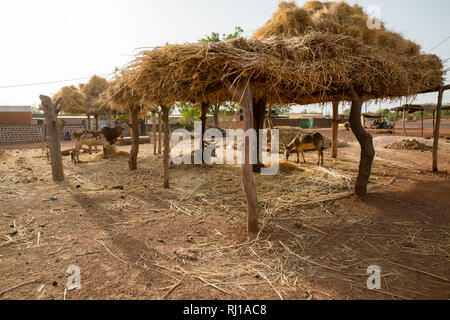 Yako town, Burkina Faso; a donkey and cows eat fodder in the shade of a farmers open air hay store. 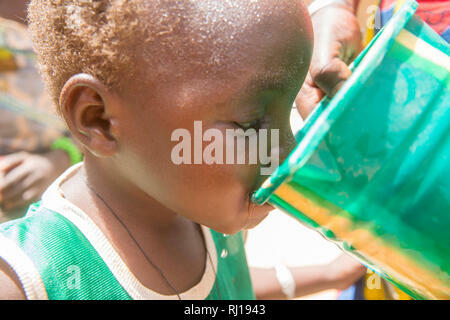 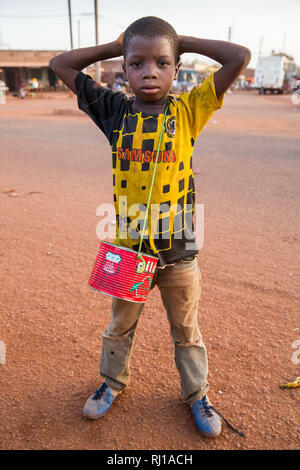 Yako, Burkina Faso; young boy with begging tin. 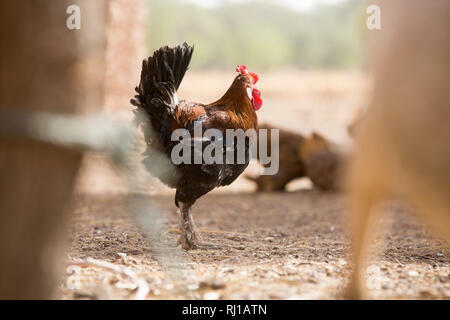 Kourono village, Yako province, Burkina Faso; Moussa Mande, 54, goat project beneficiary, also has chickens. 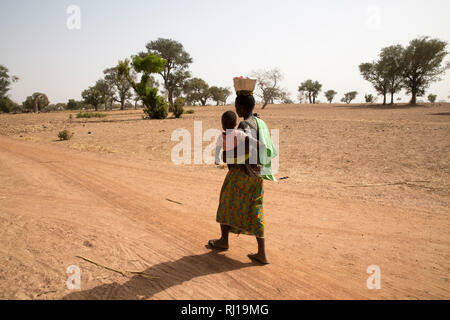 Samba village, Yako Province, Burkina Faso: A young boy carryng a fishing basket to catch fish in the lake on one of the days when fishing is allowed. 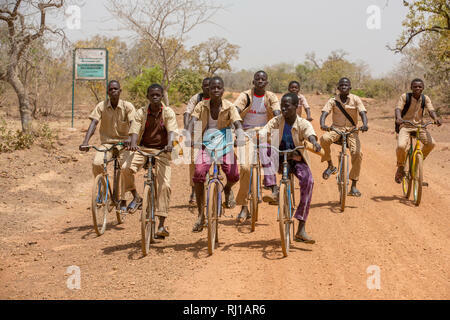 Yako Province, Burkina Faso; Boys return from school near Samba. 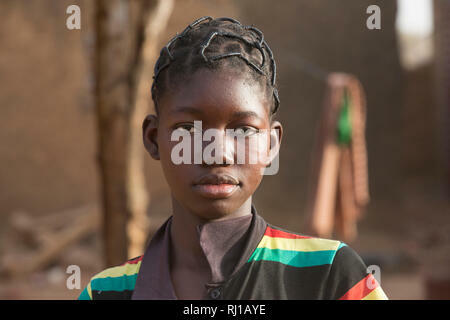 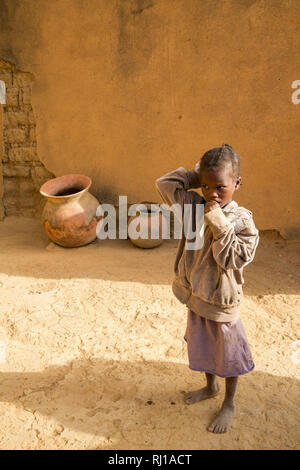 Samba village, Yako Province, Burkina Faso : a young girl, watches while her mother talking to other villagers. 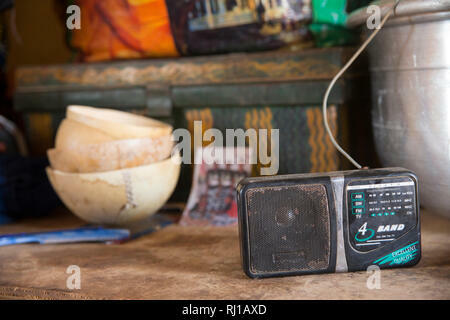 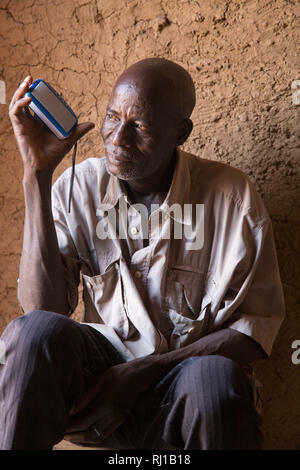 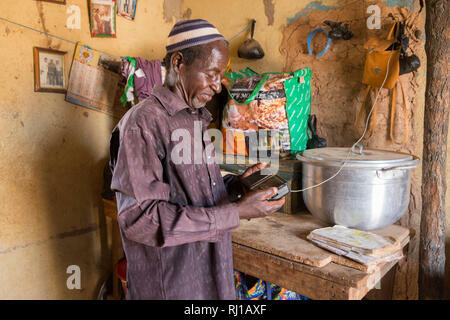 Samba village, Yako Province, Burkina Faso: A house-holder listens to an educational radio programme on nutrition broadcast by the local Natigmbzanga Radio. 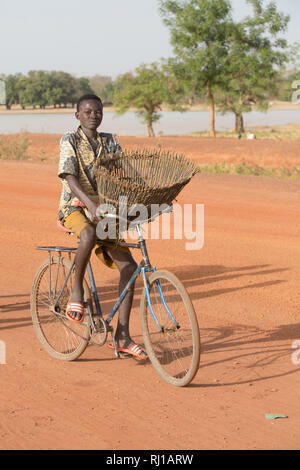 Samba village, Yako Province, Burkina Faso: A young fisherman on his way with his fishing baket to catch fish in the lake on one of the days when fishing is allowed. 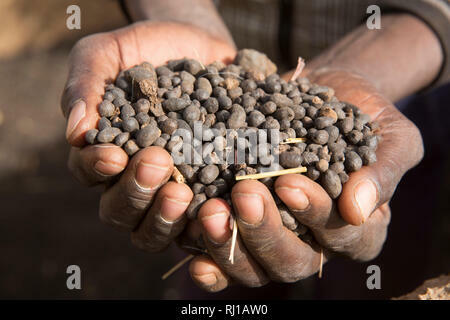 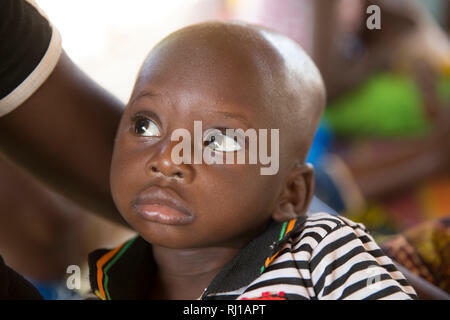 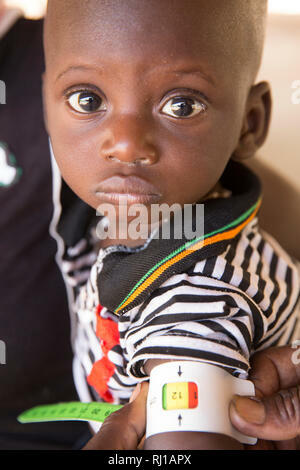 Samba village, Yako Province, Burkina Faso, Salamata's father Ram Zoundi, 61, chairman of the Nutrition team committee. 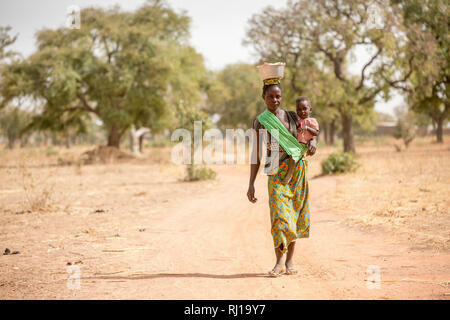 Samba village, Yako Province, Burkina Faso; Sally Zoundi, 35, with her baby Salomon Zoundi, 15 months, on her way to work at the local goldmine to support her family. 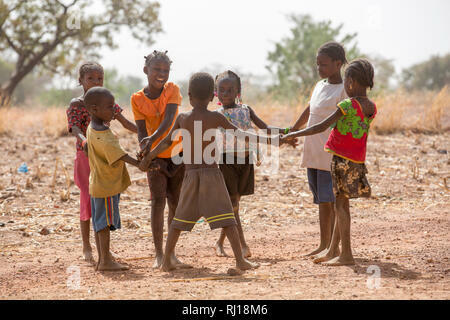 Samba village, Yako Province, Burkina Faso; children playing together. 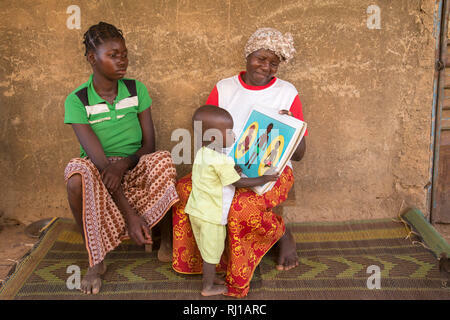 Samba village, Yako Province, Burkina Faso; Salamata Zoundi, 27, with her tiplets Christelle, Christine and Christophe, aged 2. 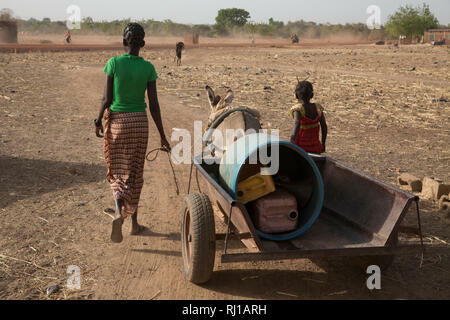 Samba village, Yako Province, Burkina Faso; schoolgirls on their way home from school wait in the shade for a friend. 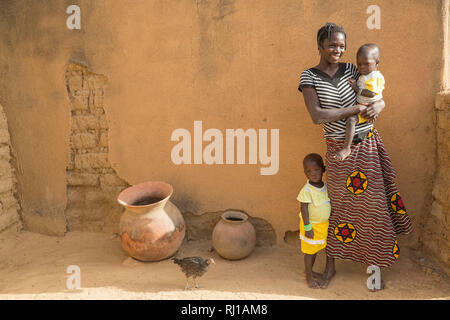 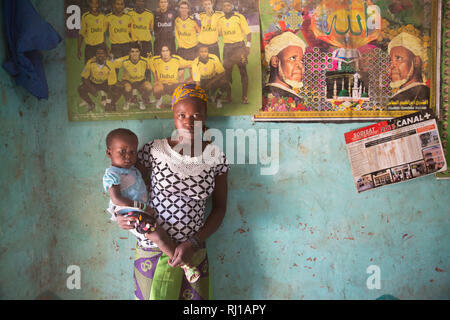 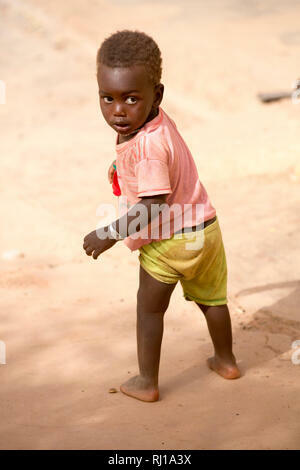 Samba village, Yako Province, Burkina Faso;Sally Zoundi's baby Salomon Zoundi, 15 months. 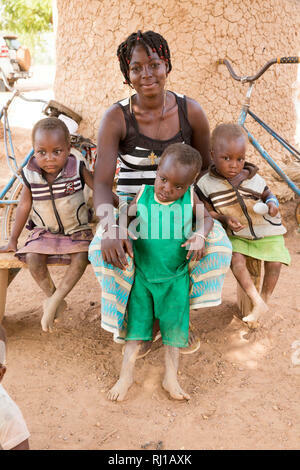 Samba village, Yako Province, Burkina Faso; Helene Pagoundba, nutrition education committee member. 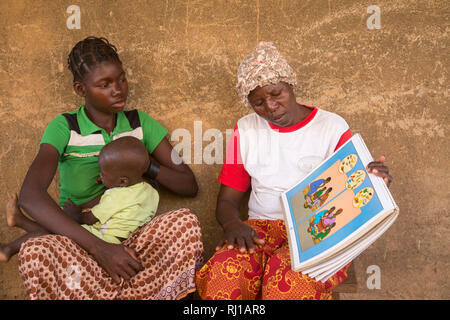 Samba village, Yako Province, Burkina Faso; Sally Zoundi, 35, with her baby Salomon Zoundi, 15 months, and her daughter Zalissa Zoundi, 10. 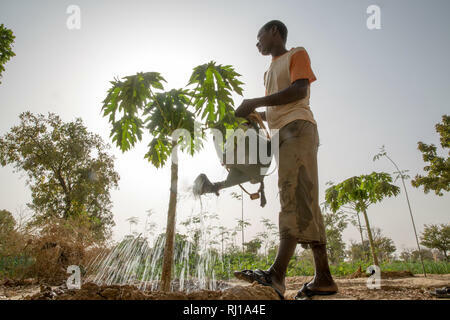 Samba village, Yako Province, Burkina Faso: Denis Zoundi, 45, husband of Collette Guiguemde, watering a small papaya tree on his market garden. 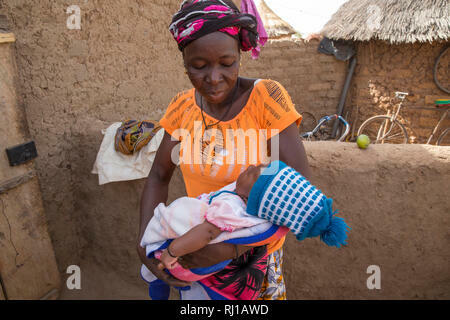 Samba village, Yako Province, Burkina Faso: Denis Zoundi, 45, with his wife Collette Guiguemde, 26, their baby Ornela Divine Zoundi, 18 months, and four-year-old daughter Eulalie Zondi at his market garden. 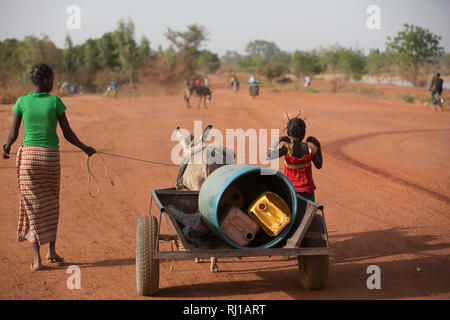 Samba village, Yako Province, Burkina Faso. 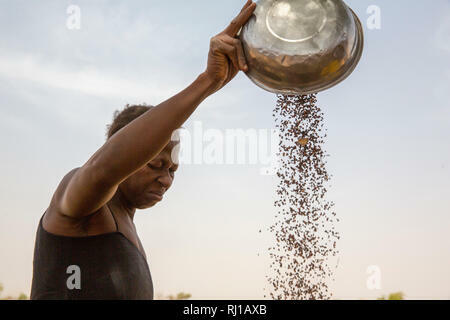 CVN demonstration of porridge making and awareness raising for mothers on child nutrition issues. 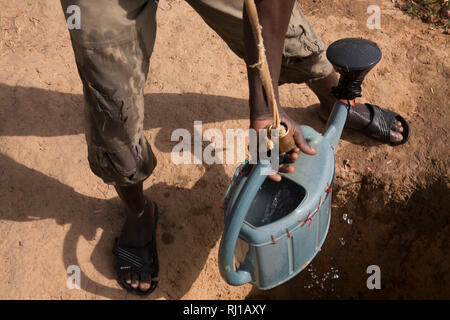 Samba village, Yako Province, Burkina Faso: Denis Zoundi, drawing water freom a well on his market garden to water his vegitable crops. 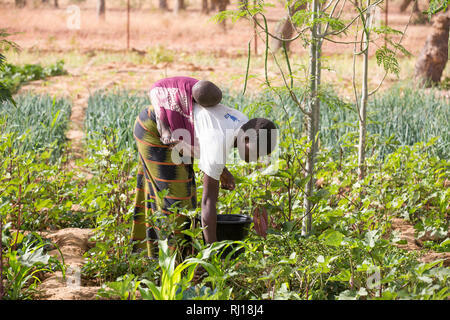 Samba village, Yako Province, Burkina Faso : Collette Guiguemde working in her husband's market garden, harvesting okra.